Arctic’s new Alpha One family is growing thanks to the addition of the 2019 M 6000 Alpha One, which is powered Cat’s 599cc two-stroke engine. L x W x H: 132.3" x 42.5" x 50"
Track: PowerClaw 154" x 15" x 3"
The 2019 Arctic Cat M 6000 Alpha One is the little brother to the M 8000 Alpha One that we had a chance to test out earlier this year. The key difference between the two lies in the powerplant. While the M 8000 Alpha One is powered by Arctic Cat’s 800-class engine, the new M 6000 Alpha One is outfitted with a 599cc two-stroke that produces about 125 horsepower. That’s still plenty gusto for playing in the steep and deep, but it should be a little easier to control. 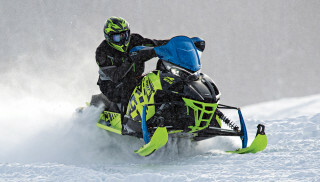 Looking at the specs, the other key difference between the two sleds is the suspension – the shocks in particular. The smaller M 6000 Alpha One relies on lower spec Arctic Cat IFP 1.5 shocks, compared to the FOX Float 3 QS3/QSL shocks on the M 8000 Alpha One. Other differences include dual halogen headlights (vs. LED), electric start (accessory on M 8000), lack of standard goggle holder, standard mountain seat (vs. lightweight mountain seat), 3.5” riser (vs. 4.5”), and only one track option. Of course, the Arctic Cat M 6000 Alpha One boasts the same rigid single rear suspension beam that set the original Alpha One part. This beam runs in the middle of the 154-inch Power Claw track. Interestingly, the track retains the same three-inch lugs of its big brother. We’ll be curious to see how the track responds to the 600-class engine. Also of note, the M 6000 Alpha One has a claimed dry weight of 466 pounds. That is actually 20 pounds heavier than the M 8000 Alpha One with the same 154-inch track. Check out the press release below for more information on the 2019 Arctic Cat M 6000 Alpha One. The newest M Series snowmobile is based on the award-winning Ascender platform and narrow profile bodywork. The lightweight and durable platform featuring narrow running boards, forward foot position and a low driveshaft provides the foundation for its deep snow carving excellence and intuitive rider ergonomics. The newest M 6000 gets its 125-hp class performance from the 6000-series C-TEC2 599cc engine with a reputation for strong, predictable throttle response and manageable performance. It features innovative Arctic Cat technology like DSI, APV electronic exhaust valves, exhaust pipe temperature sensor, electric oil injection and a new-for-2019 ceramic exhaust, as well as the no compromise convenience of push-button engine reverse. Plus it comes standard with push-button electric start. That performance stays consistent with the quick acceleration and auto-adjusting design of the TEAM Rapid Response II drive clutch, Rapid Reaction driven clutch and the entire Arctic Drive System. Yet it’s the revolutionary new ALPHA ONE rear suspension and track system that resets the M 6000 as the benchmark for easy handling and maneuverability. The system consists of a lightweight and rigid single rear suspension beam constructed from extruded aluminum and magnesium. It runs in the middle of a specially designed next-generation, lightweight 154-inch Power Claw track featuring a single row of track windows, a deep snow-specific design with 3-in. paddles and a 3.5-in. pitch, plus unique internal construction. The result is a track that bends and conforms to the snow, whether the sled is on a side hill, flat surface or climbing in deep powder. 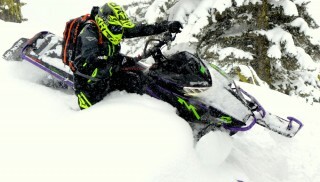 With maximum side flex, riders can easily maneuver the ALPHA ONE Mountain Cat to a degree not possible with conventional snowmobiles, carving circles well inside the tightest turns that other machines aren’t capable of. The suspension is light and stiff, allowing the new track to flex and conform to the snow and riding surface. And it still rides down a groomed trail like traditional mountain sleds. A full 11 lbs. lighter than traditional designs and all but free of trapped snow while being ridden, ALPHA ONE sets a new benchmark in lightweight mountain performance and maneuverability. Other new-for-2019 features include the G2 ProClimb-7 skis that improve balance and flotation, ease steering effort and give more consistent performance in varying snow conditions. The molded-in boot traction adds sure-footed control and usability for expert backcountry riders. Riders will also appreciate the new Stealth Lightweight Brake master cylinder and short-throw brake lever, which provide enhanced braking performance and ideal ergonomics in a more protected design. Like all 2019 M Series machines, it features new, premium handlebar-mounted controls that are optimized for use while riding, with improved ergonomics, and that transmit visible information on the digital instrument gauge. It includes a new magnetic tether switch to complement the key ignition as well as a new handlebar wiring cover covering that improves cockpit aesthetics. ALPHA ONE also features a fixed (non-telescoping) and vertical steering post, 11.7-gallon fuel tank, halogen headlight, lightweight aluminum-body Arctic Cat IFP gas shocks, a front-mounted heat exchanger that sets the standard for reduced ice buildup, plus standard ice scratchers. 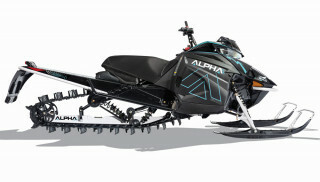 The 2019 Arctic Cat M 6000 ALPHA ONE comes in Black/Ice Blue.